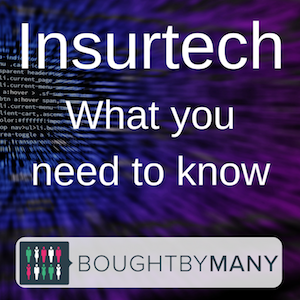 The word ‘insurtech’ is a portmanteau of insurance and technology. The accepted spelling is insurtech, although occasionally it as written as "insuretech" or "nstech". It’s a relatively new branch of fintech (financial technology) and it tends to mean companies that are using technology to improve, innovate or disrupt the insurance industry. Although start-ups dominate the insurtech space, established businesses are adopting insurtech practices, investing in and partnering with companies that aim to make the industry more efficient. Bought By Many is a multi award-winning UK insurtech business. We use data to find gaps in the market and negotiate offers or create our own products to give consumers a better deal. Here’s our revolutionary pet insurance and we’re working on a travel product for people with serious medical conditions. Follow us on LinkedIn to keep up with our blogs about the insurtech industry or become a member to find out more about our cover and groups. Insurtech businesses work in a range of ways. Some are customer-facing and aim to offer new policies and better ways to buy or use them. Others are trying to innovate behind the scenes, often improving the way larger, established companies operate. Some do a bit of both. At Bought By Many we create policies or negotiate offers based on insurance search data and make it easier for people to get a quote and buy their policies. Behind the scenes, we’re developing technology that will allow us to build new policies quickly and manage them in a way that is better for customers. 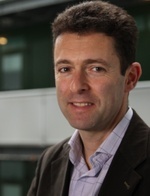 Data is a key part of insurance - companies use it create policies and set prices. For example, car insurance for young people tends to be expensive because data shows young people are likely to have more accidents and make more claims. Many of the trends listed below involve data but some businesses are focused solely on improving how big data is processed to help insurers make more accurate decisions about pricing and risk. Others are using software and hardware to collect data so policies can be tailored to the people buying them. Car insurers have been using black box, or telematics, devices for a while to offer young drivers discounts and fairer prices based on their driving ability and not just historic industry data. We use data to analyse what people and searching for so that we can see if there are gaps in what insurers are offering. AI is an area with a lot of hype and there are several ways insurtechs are developing artificial intelligence and machine learning. AI chatbots can answer customer questions about policies and as the technology develops it may be able to help people make decisions about the cover they need. We built a prototype skill enabling people to get a quote for pet insurance using Amazon's Alexa device. AI could look at the policies someone holds and notify them if there are gaps in their cover. This is part of UK insurtech Brolly’s proposition. It is also being used to help insurance staff or even make decisions for them. The UK arm of Ageas is using AI to analyse images of car accidents to decide in seconds whether a claim is valid. It’s an area to keep an eye on. Dynamic pricing and customisable policies. Some insurtech firms are trying to tailor prices and policies for individuals. This could involve using devices, such as black boxes in cars or smart technology in homes, or by having a better understanding of the data insurers already hold. AA Ireland has partnered with Silicon Valley firm Tibco to introduce dynamic pricing and cut down on fraud. We’re working to make sure there is cover for specific needs. Although we don’t customise policies for each person, we take a more considered approach to setting cover levels. For our pet insurance, we listened to what more than 40,000 pet owners said was missing from existing policies and created cover with unique options such as no prices increases and money back. Insurtech firm Cuvva allows people to get temporary car insurance on the day they need cover and Trov lets people switch cover on and off when they need it. These features aim to make insurance flexible and convenient so that it fits seamlessly into people’s lives. Online and user experience. Most insurers allow people to get a quote online but other insurance services have failed to keep up with how people use technology. And there are vast differences in insurance user experience around the world. Few companies allow customers to complete the claims process online and some quote forms still don’t work on mobile devices. Nearly all customer-facing insurtechs have designed their quote forms and account pages to be much easier for customers to use than traditional insurance companies’. Some insurtech start-ups are working with established companies to improve their user experience. It may seem like small changes are needed to improve insurance websites but it can be difficult to update legacy systems at large companies. Another online insurtech innovation is a wallet that will hold a customer’s separate policies in one place. Brolly plans to introduce a service that features an insurance locker. The company describes itself as an insurance concierge service that will help people understand and manage their insurance policies. Blockchain may be able to drive cost savings in financial services, check out our article on its practical uses in insurance. The simple answer is, yes. Some of the changes will be more obvious to consumers than others but insurtech has already started to reshape the industry. Insurtechs are providing solutions that are making insurance more transparent, efficient and fairer. Insurance is an industry ripe for innovation. Customers are often confused about how products work and what industry jargon means – it’s a difficult subject for people to get excited about. And incumbent insurers are large, rely on legacy technology and are slow to change – insurtech businesses are showing them what the future holds. Established insurers and VC firms are investing billions in insurtech companies. You can see some of the biggest deals using CBInsight’s insurtech funding round-up. PwC’s 2016 report highlights some of the top insurtech issues. 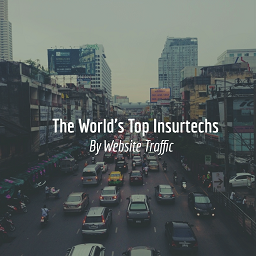 We’ve ranked companies with an insurtech business model by web traffic. We update it regularly so it’s a great way to see how companies are performing and find new businesses to watch. At the moment, Bought By Many is ranked fifth and EverQuote is number one. "Thanks for this just insured my chi fantastic price thank you so much." Check out our LinkedIn page where you can learn more about Bought By Many and see our posts about insurtech. If you have any questions about Bought By Many, insurtech or if you have a media request, feel free to get in touch.